A year since the end of the most significant pontificate since that of S Pius X. God bless the Pope Emeritus for what he did to build up the broken places and to gather the scattered into Unity. God bless him for his quiet humility; for his courage; for his remarkable learning. I do not think we shall see his like again. And God bless his successor for his recent words about the duty of bishops to live among their people according to the abiding authority of Trent. Please God, he will go on to encourage bishops to pare down their curiae to the bone; to be each the Man of his own Church and not a delegate of an episcopal conference and its bureaucracy. Please God he will look back to the equally abiding authority of earlier councils and ban translations from see to see. And will reverse the dreadful, corrupt, decision of B John XXIII that non-episcopal Curial Cardinals should as a matter of course be raised to unreal episcopacy. Despite all the tedious woffle about Vatican II as the Council which "balanced" the Papacy by putting the Episcopate into its proper place, that Council seems, in reality, to have increased the corruption of an already quite sufficiently corrupt institution. Incidentally, splendid news about the re-emergence of members of that fine team from Maryvale, where it appears they were unappreciated, to found their new Institute at Buckfast, for the New Evangelisation. Floreant. Quite often, different people turn out to have been thinking about the same things, and in similar ways. An example of this in the liturgical field concerns the Reform of the Reform; and I commend The New Liturgical Movement and other blogs for giving this blog the credit for pieces I have written over recent weeks, as they now address the same subjects. But I feel more miffed that nobody much seemed to take much account of two pieces I wrote a month ago about the reconciliation of the SSPX ... arguing that it should be seen as an ecumenical matter and followed with the same charity, urgency, and flexibility as the Holy See employs when dealing with other 'partners in dialogue'. Uncannily, this is now a headline issue because of the ecumenical outreach of the Holy Father to a Protestant group ... followed by an article (Archbold) in an American journal (NCR) arguing precisely the case I argued ... followed by the odd removal of that article by the proprietors of the journal concerned. One rather wonders about that removal. Who leaned on whom? Or who thought that they might be leaned on by whom if they didn't delete the article first? Of course, there is a real difference between cosying up to evangelical Protestants and considering unity with fellow Catholics, as Anglican Catholics discovered when Benedict XVI had the courage to brave the storms of malevolence and erect the Ordinariates. I suppose there is even more toxicity surrounding the matter of the SSPX. In media and PR terms, suggesting unity with evangelical Protestants is like cuddling a bunny rabbit with soft, silky fur, while advocating overtures towards the SSPX more closely resembles fondling broken glass. This is at least partly because ecumenism is really the pursuit of internal Church politics by other means. Another thing that I explained quite recently. I reprint below my two pieces on the SSPX, unchanged, and the second half of my piece on the Politics of Ecumenism. In the relationship between the Holy See and the SSPX, there is one enormous fundamental problem, which is so obvious that few people mention it. As a member of an Ordinariate, Benedict XVI's other and successful ecumenical endeavour, I have a natural interest in this question and pray for its resolution. That is the locus standi from which I ask the following question. SSPX and the Vatican ... is this a matter of Ecumenism or of Church Discipline? Is the SSPX a group of beloved Separated Brethren with whom we Catholics should, in accordance with the mandate of Vatican II, strain every sinew to secure unity ... because, with their immensely rich spirituality, they have so much to offer the Catholic Church; or is it merely a portion of the Latin Church in an irregular canonical situation which needs to be thoroughly bashed around the head, like the Franciscans of the Immaculate, until it abjectly grovels? Both the Holy See and the SSPX in effect conspire to ensure that the second model applies; Rome, because of her natural inclination to exercise control over the Latin Church; the SSPX, because it believes itself to be, not only part of the Latin Church, but even its only truly healthy and doctrinally sound part. But what if Rome, at least, were to try the first model? Suppose they were to treat the 'problems' which the SSPX has with Vatican II in the same way that Rome treats the 'problems' of the 'Nestorians' or 'Monophysites'? With them, Rome is happy to the point of euphoria about securing Christological agreements, without demanding explicit acceptance of Ephesus or Chalcedon. Or take the Anglicans, who, without accepting the actual words of Trent, were told by dicasteries including the CDF that the last document ('Clarifications') in the Eucharistic section of the ARCIC process meant that 'no further work' was necessary on that matter? Or, to put it differently: If the only obstacle between Rome and the Russian and Greek Churches were Dignitatis humanae, would Rome really insist that no further progress would be possible without explicit submission by the Orthodox both to that Conciliar document and to 'the entire post-Conciliar Magisterium'? The Curial bureaucrats, then, are trying both to have their cake and to eat it. When it suits them, they will treat SSPX as disobedient subjects rather than as Separated Brethren. But when the exigencies of the polemics require it, as they did towards the end of last year, they talk about the SSPX as being in schism, or even being in some imprecise sense excommunicate. But they would do well to think carefully about the implications of such assessments for the status of the dialogue. Because if members of SSPX are excommunicate schismatics, then they qualify for the treatment which Unitatis redintegratio prescribed for Separated Brethren*. Or, to put the same point (again) differently: Is it really Vatican policy to wait a millennium or half a millennium for Time to solidify and make ever more bitter the break between Rome and the SSPX, and, once the breach is sufficiently long-term, acrimonious, and definitive, then finally, but only then, to move on to all the sentimental and cuddly rituals of the Open-Arms Dear-Sister-Churches part of the ecumenical process? I know there is an old saw about Rome thinking in terms of centuries ... but can that really be the plan? *There is also a pastoral and canonical aspect to this. Anti-SSPX writers commonly assert that SSPX marriages are invalid. But if SSPX is outside the Church, then they are as valid as Methodist or Lutheran marriages. And absolutions are as valid as Vatican praxis deems Orthodox absolutions to be. Wouldn't it, anyway, be an admirable pastoral gesture in Unity Week for Rome to concede jurisdiction in these matters to SSPX priests and issue a sanatio of all previous SSPX marriages? It would have same bigness, the same generosity, as the remission of the excommunications by Benedict XVI. This was rather like looking at the Orthodox wine glass and saying "Goody! It's three quarters (or more) full". But in the dialogue between the Vatican and the SSPX, all the time has been spent haggling about whether the SSPX glass might be a milligram or two less than full. The modern Catholic Ecumenical Industry does not shout at Orthodoxy "You must accept every word in the Decrees of Florence, and the entire post-Florentine papal Magisterium". Or, if it does, it does so too quietly for me to have heard it. One curial official has recently said, of the SSPX, that "they must change their approach and accept the conditions of the Catholic Church and the Supreme Pontiff". Is this the way that the Vatican talks about the Orthodox ... or the Methodists ... ? I think that the situation with regard to the SSPX is urgent. Although Archbishop Lefebvre wisely chose young men to be consecrated bishops, those young men are now 25 years older. The time must come when the problems surrounding the consecration of their successors will have to faced. Must we really, when that time comes, revisit all those bad-tempered and endless arguments about States of Necessity and Excommunications latae sententiae? Is there any other single ecclesial group for whom the Holy See would prescribe that lugubrious prospect as the Way Forward to a Joyful Reconciliation? Is it to be for nothing that Benedict XVI cut that particular Gordian Knot? And, by doing so, incurred the ranting calumnies of the ignorant and the ill-disposed? Pope Francis has critics who believe that his openness, his humility, his desire to cut through red tape, his preference for a Church that does something even if mistakes are made, is all PR, all posturing. I do not think that they are right. I think he is prayer-filled and sincere. Then he could deliver an address on Reconciliation. It might go down in History as his Beard of Aaron Address. Or if the Holy Father is not adventurous enough, or not sufficiently his own master, to be able to do this, the remission of Archbishop Lefebvre's excommunication would be a first and a gracious gesture. And the more inane or childish you think my remarks and my opinions are, the more I think you ought to stop sniggering and face up to the questions I posed in my previous post: is there a Plan in place, other than the plan of waiting for the decades to change into centuries and the breach to become set in stone? And: is that the Vatican II model of Ecumenism? * As Vatican observers have often pointed out, the obvious solution is to 'grant' to the SSPX precisely what, de facto, they already have. This would preserve the Holy See from the indignity of negotiating, and very considerably reduce the risk of a split within the SSPX. There need only be included two extra provisions, both lifted from Anglicanorum coetibus: (1) requiring the SSPX to consult with local hierarchies/ordinaries about developments in their mission without giving the hierarchies/ordinaries any right of actual veto; and (2) providing for the Council of SSPX to send a terna to Rome when an episcopal vacancy happens. A substitute could then at once be nominated for Bishop Williamson. A thought is growing upon me. I throw it out simply as a balon d'essai for you to shoot down. It is: that Ecumenism is in practice often more to do with changing the body one currently belongs to than (to dust down some of the old cliches) about Learning from Others, Sharing our Respective Insights. (I say 'often' because, of course there are genuine ecumenists such as Fr Aidan Nichols, who has devoted so much time and energy to working in our interests.) Take the question of the SSPX. I have little sense that among professional Catholic ecumenists there is burning desire to Learn from the Priestly Society, to garner its specific Insights. It might be thought Progressive and Ecumenical to organise an 'exchange' and send some Catholic seminarians for a term or two to an Orthodox ... or even an Anglican ... seminary; but when did you last hear of a Catholic bishop planning to send some of his seminarians to Econe? And when Good Pope Benedict set up the Ordinariates, how did some of those Catholics who had always been noisiest about Unity react? With all the horror that their mentor the Evil One also felt. Because the Mammoth in the Room was that they had long been doing anything they could to Anglicanise the Catholic Church ... Clerical Marriage ... ordained women ... sabotaged sexual ethics ... diluted doctrine ... you name it. Unity was to be damned as soon as they realised that what God was in fact giving them was an influx of highly orthodox and orthopractic Anglican Catholics. Their own very specific and unmistakable choice of which part of the Anglican inheritance they had wished to be united with ... and which part of it they had strongly preferred to remain disunited from ... was a function of their own intra-ecclesial political agenda. Their bluff was called. Anglican Catholics and SSPXers are those to whom the Catholic Church is in fact closest, but who, because of that very propinquity, are ignored (and worse) by those who use the banner of Ecumenism as a banner of dissent from the Magisterium. In the style of old-fashioned General Papers, I offer the following Essay Question, replete with spoof quotation. "An enthusiasm for Unity is sometimes motivated by a prior enthusiasm to change ones own Church." Discuss. One occasionally hears it said among clergy that, while it is understandable that the elderly should have an affection for the tradition in which they grew up, a preference for the Ancient Roman Rite when found among the young, can only be a fashion or a fad. This reminds me of a lecturer at Oxford in the mid-1960s, Austin Baker, who quoted the view of the psalmist that never had he seen the poor and righteous man begging his bread, and commented: "It makes one want to say: 'You should try to get out a bit more'". That memory came vividly back to me when I had the privilege to stay with a vibrant young community, the Transalpine Redemptorists on Papa Stronsay. Not only is the Community young in the sense we use that word with regard to many other communities (that they're mostly under 65), but it is really young. And what a 'fashion'! They get up in the morning at the faddish time of 4.55. They not only pray hard all day, but work hard all day. There is a atmosphere of 24/7/365 commitment. To those who call such commitment to the religious life and the Church's ancient Liturgy (Mass and Office, Vetus Ordo) a 'fashion', I would suggest "You should try to get out a bit more ... broaden your narrow horizons ... meet more real people ... find out what their 'fashion' commits them to ... how their 'fashion', aka Divine Grace, truly does 'fashion' them". I can only say how deeply impressed I was by the experience of a religious community drawing living water from the deep wells of the religious life as it was lived before the collapses of the 1960s and 1970s. Members of the Community had come all the way to Oxford for the occasion of my 'Catholic Ordination'. And to London the next morning when I said my First Mass in full communion with the See of S Peter at that lovely pietra dura Lady Altar in the Brompton Oratory. Their warm and loving sympathy had helped to sustain me in the difficult months which had gone before. And that such wonderful people should actually invite me to go and give them some Conferences! It was a six stage journey: 'bus into Oxford; coach to Birmingham; plane to Aberdeen; plane to Kirkwall; ferry to Stronsay; small boat to Papa Stronsay ... all meticulously planned by the Community. I was shown Kirkwall Cathedral, very much in the spirit of Durham but in a lovely pink sandstone; less 'empty' than most Anglican Cathedrals because, at the Reformation, the relics from its two great shrines, of S Magnus and S Rognvald, were preserved by being carefully placed in cavities behind stones in two of the pillars. But the 'real' place of prayer was the lovely little chapel on Papa Stronsay itself; holy, as Newman explained, as no other place can be holy, because of the Great Presence upon the Altar, the crucified Redeemer, the Man of Golgotha, by whose wounds we are healed. And Papa Stronsay is under the guardianship of our Lady of Perpetual Succour ... you leave her in the Chapel and she welcomes you in the Refectory. As we sang Salve Regina at the end of each Conference, I looked into her eyes and realised how powerful those misericordes oculi are. The Redemptorists were not the first monks to occupy the island ... the name 'Papa' indicates that. Before the Vikings, way back in the first millennium, monks built their dwellings and chapels there; a decade or so ago, excavations revealed something of the history. Its fertility was such that the Viking went there for malt before their drinking bouts; and the brethren still skilfully exploit that fertility to challenge the Guinness Book of Records with the dimensions of the fruit they grow. We dodged the fulmars to walk round the island; I felt a little humbled when a gate was opened for me which an athletic visiting bishop, cassock and all, had leaped over with but one hand on the gatepost! Perhaps in centuries to come the Guestmaster will tell pilgrims the legend of Bishop ******'s Leap! I gathered that I was staying in 'Father Aidan's Room', which I could not but regard as a great honour. How rare it is when one has a completely flawless and totally exhilarating six days ... ah, but I was forgetting! Something did go wrong! My case failed to make the transit at Aberdeen Airport! But ... not to worry ... kind hands recovered it and other kindly hands put it on the plane for Kirkwall and yet more transferred it to the ferry and finally, in a howling Orkney Gale, a small boat brought it across and willing hands heaved it over the Surging Brine and on to the jetty. And the gale soon blew itself out and gave way to the Aurora Borealis lighting us from the North. And those stars ... they were so gigantic ... so near! ... that I have been away for a few days visiting dear friends in the Orkneys; which I will say more about soon. My apologies to those who were puzzled not to see their comments appearing on threads. I have now raced through and enabled most of them. I am also sorry if my finger slipped and some worthy contributions were accidentally consigned to oblivion. Those who enjoy reading threads will have a lot to read. One quick point about sources, which I am moved to offer because some of those who seem quite sure that the Roman Canon once had an epiclesis quote Fortescue and the Catholic Encyclopedia at me. These are manuals which go back to the beginning of the twentieth century and do no represent the scholarship of the latter part of that century. For the mid-century, try Jungmann The Mass of the Roman Rite, still indispensible as a source of information and references, and Dix Shape of the Liturgy through their indexes. More recently, Paul Bradshaw has made a thing of declining to accept universal common patterns in early liturgies at all. One of the many big lacunae in my knowledge is Recusant Literature. And I wonder if, in Recusant Literature, there is any evidence of how the Catholic Squirearchy reacted to the replacement of the 'Sarum rite' by the Missal of S Pius V.
Of course, we all know that the difference between those two 'rites' is very slight. But that is the judgement of bookish people like us, considering principally text. As Adrian Fortescue put it, Sarum and the rest "are merely the Roman rite with quite unimportant local variations. They can indeed hardly be called derived rites; if one may take a parallel from philology one may describe them best as dialects of the Roman rite ... To distinguish the Roman, Sarum, and Mozarabic liturgies on the same plane is like classifying English, Yorkshire dialect, and French as three languages." Thoroughly true. But they do look rather different. When the priest had consecrated the Host, he did not genuflect. He 'inclined himself' ... one edition says that he adored It by bowing his head ... then elevated It by lifting It for the people to see. He did not 'adore' or 'incline' again, but went on to consecrate the Chalice. After that, he did not make any act of reverence, but lifted the Chalice 'as far as his chest OR over his head'. He then stretched out his arms 'in modum crucis' for the first part of the Unde et memores. I would have thought that the Tridentine ceremonial, familiar to us, would have seemed rather strange to those brought up on Sarum. And one could make the same point from the beginning of Mass to the end. Fortescue (pp 202-3 fn 4) tells how Dr Lawrence Webb arrived from Rome at Douay in December 1576 and taught the young men how to do the new rite. He cites Records of the English Catholics under the Penal Laws, London, 1878, p118. Does anybody have that to hand? Are then any suggestive details? Anybody have any actual evidence about how the laity reacted? Is there any bibliographical evidence about the survival of Sarum or the introduction of S Pius V? And Fortescue had been told, but had been unable to verify the claim, that some priests brought Sarum back into use in the happy reign of our late Sovereign Lord King James II. Anybody know anything? The 1998 CDF Commentary on Ad tuendam fidem (paragraph 11) gives examples of "truths connected to revelation by historical necessity and which are to be held definitively". One was the Canonisation of Saints, upon which I commented in my recent piece about the Infallibility - or otherwise - of Canonisation. 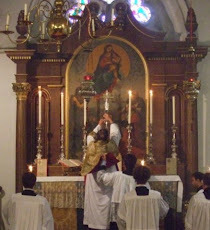 Another was the Bull Apostolicae curae, upon which I wrote in my final piece on Reordination. I now move on to "the legitimacy of the election of the Sovereign Pontiff". I have near my desk a useful little CTS pamphlet (1958) (it cost me 6d when I was a smart little chap of seventeen ... money well spent): The Popes from St Peter to Pius XII. Jolly good for dates and simple summaries. Based upon the Annuario Pontificio of 1904 and 1905. Each pope has his own number. Numbers 112, 114, 116: Pope Formosus was posthumously deposed by his successor Stephen VII but rehabilitated by his successor Theodore II. 119 Leo V: "Regarded as probably an anti-pope". Leo VIII (993): "His election is of doubtful validity". 133 Benedict V: "His election is of doubtful validity". 146A Sylvester III: "His election is of doubtful validity". 147 Gregory VI: "His election therefore is of doubtful validity". 200 Urban VI: "The election ... has however been generally deemed valid". Quite a bag of popes here about whose legitimacy (or illegitimacy) greater or lesser doubts are openly expressed. If the list-makers are themselves in such states of doubt, how can the ordinary Catholic know how to submit to the requirements ("to be held definitively") implied by the Commentary? Urban VI, number 200, is fairly important. Upon his status depends the question whether, from 1378 onwards, the 'Roman' popes or the 'Avignon' popes were the true line. The schism lasted until 1417 and there has never been, as far as I am aware, a definitive resolution of the uncertainties before that date. To say that his "election has been generally deemed valid" seems to my untutored eye much weaker than "the legitimacy of his election is to be held definitively". And, to add to the confusions, respectable authors have imported an axiom Papa dubius Papa nullus (I can't discover who first deployed it) to argue that, during the Great Schism, there was for four decades no Pope at all. You can see why this has some appeal: after the Council of Pisa (1409) the 'Roman' pope, Gregory XII, commonly regarded as the 'real' pope, did not have jurisdiction beyond Italy; the 'Avignon' 'antipope' Benedict XIII was accepted by nobody outside a little Spanish town called Peniscola; and the Pisan 'antipope' Alexander V held sway over the rest of the world. Yeah ... I know ... I am trying your patience. The Commentary is simply clobbering modern sedevacantists ... and so it jolly well should ... all power to its elbow ... not spraying irrelevant anathemas all over historical pedants who hold divergent views about the status of long dead popes and antipopes, or excommunicating the chappies who keep revising the list in the Annuario every generation or so. Have some common sense, Fr H. Fair enough. But ... and this is my real point ... I think the methodology of the Commentary is lacking in logical rigour. It cannot really mean what it says. And it risks dragging into disrepute the entire concept of "to be held definitively". In strictly logical terms, why should it be what-the-Hell-who-cares to dispute the validity of the election of Gregory VI but totally terrible to question that of Benedict XVI? Over the years, apparently, definitive tenendum gradually evaporates. As the magicians say, Now you see it, now you don't. My tentative conclusion (I really am open to well-argued elucidations but not to irritable rants) is that this paragraph in the Commentary is intended to point pastorally and reliably to where authentic Church Life is, here and now, to be found and lived. It is to be found in communion with Francis, who really is Pope (not in sedevacantist groups); in community with the public invocation of those whom he has declared Saints; and it is not to be found in the sacramental life of Anglican ecclesial bodies. Sure pointers to sure realities; reliable notice-boards about real minefields where Death truly lurks. That is why, here and now, observing it as definitive tenendum keeps you safe, and is important. But, despite its rather fierce appearance, this language is not intended, cannot be intended, as an implacable iron rule to resolve every doubt in past history - it just doesn't work - nor can it, will it, be an eternal mill-stone round the Church's neck. As a not insignificant final detail, I point out that the Commentary was not approved by the Roman Pontiff in forma specifica; indeed, it was not approved by him at all. This is some sort of pointer to its level of Magisterial status, yes? (1) Maundy Thursday. What will our Holy Father do? Will he, like last year, disregarded the law confining those whose feet he washes to the half of humanity called viri (don't write in trying to convince me that this does not mean males)? A year ago he was recently elected; he had made decisions in a hurry; and some of the rhetorical reaction to what he did was probably excessive. This year, he will have had time to think and to take advice and to decide. (a) He can change the Law. I am not keen on this because the current use with regard to the pedilavium is of great antiquity and has meaning. But I am not the Church's Summus Legifer. If he changes it, then the Law has changed. I am neither antinomian nor sedevacantist. (b) He can follow the current law. One would assume that this is, in the very least, the fall-back position of any Catholic cleric. (c) As I pointed out much earlier, he could do the pedilavium, formally and liturgically, in accordance with the law. Then, extraliturgically, he could go out into the streets and perform this vivid acted ikon of Humility in any way that takes his fancy. (d) Since the pedilavium is not compulsory, and, indeed, only entered the Missa in Coena Domini comparatively recently, he could omit it during the Liturgy, and, separately, do it extraliturgically. (ii) that it is lawful for anybody to disregard liturgical Law when they consider that they have a compelling reason. (2) Good Friday. What will the SSPX do; indeed, what have the SSPX done on recent Good Fridays? (a) Have they used the the 1962 rites but with the form of prayer Pro Iudaeis composed and imposed by Pope Benedict XVI? If so, they have, in my view, behaved rationally and lawfully. (i) the 1962 Holy Week Rite is not some set of liturgies which came down fully-formed from Heaven, nor one which was handed down intact from early times. It was devised by Archbishop Bugnini and imposed by Pope Pius XII, then revised and inserted into the Missale Romanum and imposed by B John XXIII. It represents a very considerable modification of what the Roman Rite did previously. Thus the forms found in 1962 have precisely the same legal and customary force (and no more) as the Prayer Pro Iudaeis imposed by Benedict XVI. Unless one is a sedevacantist, it is purely arbitrary to accept the massive alterations decreed by Pius XII and to refuse the change made to just one prayer by Benedict XVI. (ii) There is a more historical approach to liturgical authority which sees it as essentially resting upon what Ancient Tradition has handed down to us. Benedict XVI, laudably, gestured towards this attitude when, in issuing Summorum Pontificum, he commented that what has been sacred cannot become forbidden. If the SSPX regard this as the essence of liturgical authority, I would have to express much sympathy for them. And, in this case, they will have reverted to the Ordo Hebdomadae Sanctae which preceded Pius XII. And, of course, in using that ancient set of usages, they will not have changed the Prayer Pro Iudaeis. Because Benedict XVI did not impose his own new composition upon the pre-Bugnini, pre-Pius XII, rite; he imposed it on the 1962 rite. I would be interested if readers were able to refine the logic I have tried to follow in all this. I will be less interested in comments which are merely forcefully phrased expressions of personal preference or prejudice or dislike. The subject concerned is the statement in Summorum Pontificum that the traditional Roman Mass had never been lawfully abrogated. The problem about this is that the praxis of the Roman Curia since the promulgation of the Pauline Missal* appeared to have been based on an assumption of abrogation of the preceding rite. And Cardinal Ratzinger himself had once spoken with regret about that 'abrogation' ... and you can't regret something which has not been done. Mind you, I have always felt, and have written in this blog about the fact that, there was an oddity about the failure of the Pauline Decree explicitly to abrogate the earlier Missal in view of the very clear abrogation in the corresponding document about the Breviary (and Summorum Pontificum did not claim that the old Breviary "had never been abrogated"). But I propose to accept, for the sake of argument, Gendinning's demonstration that supersession implies abrogation. Nor do I intend to write about the Commission of canonist Cardinals which is said to have delivered, some years ago, an opinion that the Old Missal had never been abrogated - although I would welcome information at this moment on the thread about this matter. My intention is to examine the earlier teaching of Joseph Cardinal Ratzinger on the post-Conciliar events and to suggest that his judgement as Pope upon the non-abrogation of the Old Missal is a theological statement as important as, and indeed very closely related to, his teaching in his justly celebrated Address to the Roman Curia about a Hermeneutic of Continuity. Unlike Glendinning and the canonists he quotes, I see Papa Ratzinger's pronouncement in this matter as another sign of his very considerable greatness. And as an ecumenical step of very profound significance. *Glendinning points out the oddity of Paul VI (followed by John Paul II) promulgating a rite which had, at the point of promulgation, not quite been written. Sometimes a parallel is suggested between S Pius V, revising the Roman Rite after and by mandate of the Council of Trent, and Paul VI, revising it after and by mandate of Vatican II. This is, I believe, a gross misunderstanding (i) of what S Pius was about, as he describes his own actions in Quo primum; and (ii) of the considerable differences between those two events. S Pius has been seen as suppressing variant dialects of the Roman Rite - such as the English Sarum Rite - in the interests of a centralising uniformity. This analysis does not fit the facts. In the later sixteenth century, there was a fair amount of liturgical experimentation - and S Pius intends to suppress such innovations in the Eucharist. He does not intend to suppress established rites with a couple of centuries' history. Let us look at his words enforcing his new edition "... nisi ab ipsa prima institutione a Sede Apostolica adprobata, vel consuetudine, quae, vel ipsa institutio super ducentos annos missarum celebrandarum in eisdem ecclesiis assidue observata sit: a quibus, ut praefatam celebrandi constitutionem, vel consuetudinem nequaquam auferimus; so there ... just my point ... but he goes on sic, si Missale hoc ... magis placeret ..." and ah!, you cry, so - with a nudge and a wink - S Pius is encouraging churches with a 200 year prescription to change over to his new edition! But No! ... he goes on "de episcopi, vel praelati, Capitulique universi consensu ...". "Capituli universi consensu!" So, apparently, even just one bolshie traddie Canon on a Chapter could veto the desire of some episcopal johnnie-come-lately to introduce the Pian edition of the Missal into the diocese! What we have here is not a policy of universal standardisation by an autocrat, but the mandated preservation of the old and sanctified dialects of the Roman Rite combined with a firm suppression of recent faddery. There is some interest in comparing the legislation of S Pius with what could happen elsewhere in the West. In one province, a metropolitan Archbishop, who had secured the support of the secular state and control of the technology of printing, decreed that "whereas heretofore there hath been great diversity in saying and singing in the Churches within this realm: some following Salisbury Use, some Hereford Use, and some the Use of Bangor, some of York, some of Lincoln; now from henceforth all the whole Realm shall have but one Use". Thomas Cranmer had little thought of subjecting his abolition of ancient uses - which certainly had a prescription of more than two hundred years - to a veto even by a majority of a Cathedral Chapter. When the Chapter at S Paul's, London, adopted his new rite but attempted merely to graft onto it certain features of their previous customs, a peremptory order by the Privy Council put an end to the attempt. One wonders whether the legislation of Paul VI, resembles much more closely the actions of the Tudor regime than it does the precedents set by S Pius. Add to this, the process which S Pius employed to produce his new edition: the examination of old versions in the Vatican Library; the collection of other exemplars; a reading of old liturgical authors. His missal was "recognitum iam et castigatum". It was not, like the Missal of Paul VI, a rite marked on every single page with revolutionary innovations. Nobody denies that the 'Tridentine' Missal differs very little from earlier editions. Nobody claims that alterations were made in the Canon which had no basis in its textual history; that a dozen or so alternative 'Eucharistic Prayers' were added; or that the Collects, Epistles, and Gospels of every single Sunday were changed. Nobody can deny that all this is true of the Pauline Missal*. One pope publishes a very light standardisation with a 98% unchanged text; another pope publishes a vastly different rite. I now address an ad hominem argument to those who believe that the two events match each other: if that earlier pope deemed it wrong that variant dialects of the Roman Rite (not so very different from the Rite he had edited) should lightly be set aside when they had a couple of centuries behind them, then, a fortiori, it would be incongruous for the later pope to think it right, or inevitable, that all the earlier dialects of the Roman Rite (representing, in their developed forms, something like a thousand years of history) should be set aside ... without even a mention that he was mandating such an unheard-of revolution. I do not like some propaganda of the SSPX which appears to suggest that Quo primum made the Pian edition immutable. Certainly no future Pontiff deemed it immutable; they presided over its organic evolution. But the Pauline missal was not just one more light, slight, evolutionary revision of the Pian Missal. Those who most strongly argue that the Pian events and the Pauline events were parallel and congruous can hardly avoid the conclusion that Paul did not desire ... any more than Pius intended ... to consign the traditional forms of the Roman Rite to the rubbish dump. I offer these thoughts as my meditation upon the words I quoted in my last post from Cardinal Ratzinger: that it is contrary to the Spirit of the Church to abolish the rites which have served the piety and lives of generations of Christians. Continues, and gets more ecclesiological. *Well, I suppose that in the Pauline Missal two or three Sundays after Epiphany somehow managed to keep their collects. And Palm Sunday. In 1999 Cardinal Ratzinger wrote: "Rites ... are forms of the Apostolic Tradition and of its unfolding in the great places of the Tradition." ... He had in the same book previously observed that these places, Rome, Alexandria, and Antioch, all are "connected with Petrine traditions" ... it is not only in Rome that Peter speaks in the Paradosis. He goes on: "The liturgy cannot be compared to a piece of technical equipment, something manufactured, but to a plant, something organic that grows and whose laws of growth determine the possibilities of further development". Notice that he uses the term 'laws' in a way which has nothing whatsoever to do with enacted legislation. He is discerning principles of ecclesial life which go deeper than Canon Law. As Ratzinger continues, it seems to me that he shows a markedly limited enthusiasm for the intrusion into Liturgy, in the West, of the juridical authority of the papacy. "The more vigorously the papacy was displayed, the more the question came up of about the extent and limits of this authority, which, of course, as such had never been considered. After the Second Vatican Council, the impression arose that the pope really could do anything in liturgical matters, especially if he were acting on the mandate of an ecumenical council. Eventually, the idea of the givenness of the liturgy, the fact that one cannot do with it what one will, faded from the consciousness of the West [observe his emphasis that he is speaking of Western phenomena]. In fact, the First Vatican Council had in no way defined the pope as an absolute monarch. On the contrary, it presented him as the guarantor of obedience to the revealed word. The pope's authority is bound to the Tradition of faith, and that also applies to the liturgy. It is not 'manufactured' by the authorities. Even the pope can only be a humble servant of its lawful development and abiding integrity and identity." It seems to me that Cardinal Ratzinger's concerns are less with Canon Law than with an unwritten law inscribed in the very nature of the Church (the embodiment of authentic tradition), which trumps the law embodied in transient canonical codes and enactments. He is not concerned to join in the scrimmage of canonists as they examine their manuals and gather their precedents in order to discover exactly how a particular decree of Paul VI might or might not be glossed. What he is writing is Theology. His subject is the Spirit-filled life of the Catholic Church. The final part of this series is the piece I reprinted yesterday. I wonder if any readers know how the process is advancing for the Canonisation of Blessed Clement. And, indeed, how widespread his cultus is. Liberal elites throw up their hands in horror at the old-style, 'hard', in-your-face, Nazism, while themselves (as demonstrated recently in Belgium) being fervent apostles for the new, caring, 'soft', let-me-give-you-a-cuddle, Nazism. Ich klage an. I dealt in three recent posts with the desire of liturgical 'progressives' to cut modern congregations off from the Liturgy of the Church by imposing an English translation which obscures, to the point of total opacity, what Pope Paul VI's Missal (issued after Vatican II) actually sought to put before the worshipper. Denis Archdeacon (see those earlier posts) goes explicitly further. He writes "the Latin original should be set aside. Then the Bishops' Conferences of the English-speaking world, with the help of the best liturgists, writers and poets, could commission a completely new English text of the Mass". Let us be quite clear what is being suggested. From the day in 597 when S Augustine arrived in Kent, it was the Roman Rite which he and his collaborators brought to this country. Pope Gregory himself had actually advised them to be more eclectic; and, at that time, the Roman Rite did not extend far beyond Rome itself (it was not until the reign of Charlemagne that a major effort was made to enforce it throughout Gaul). But this little, nascent, English Church was a tiny island of superb Romanita in a great sea of non-Roman Latin Christianity. Our earliest scholar of international standing, S Bede the Venerable, wrote his Historia to demonstrate this fact. The great Anglican liturgist G G Willis demonstrated how Roman was the genius and practice of Anglo-Saxon Christianity. Indeed, the same seems to have become true throughout these islands: the early Irish 'Stowe Missal' has no resemblance to spurious modern invented 'Celtic Christianities' which spawn the so-called 'Celtic' whatevers all over the daft 'Celtic Christianity' sections of religious bookshops: Stowe is the Roman Rite, its Eucharistic Prayer is the Roman Canon, and the book even exhibits features going back to before S Gregory I reformed that rite by making the Lord's Prayer follow immediately after the Canon. The Roman Rite ... divided after the Norman Conquest into slightly variant 'dialects' ... the Sarum or York or Hereford uses ... remained the religion of Englishmen until 1559. It survived the Reformation in the persecuted communities of Elizabethan England. Diversity of dialect began to disappear after December 1576, when the students at Douay started to study the version of the Roman Rite newly published by S Pius V. After 1850, thousands of Anglican clergy endured persecution to reintroduce that Roman Rite into their churches: their spiritual descendants now form the Ordinariate. The years after Vatican II saw the reappearance of 'dialects' of the same Roman Rite: not now Sarum or Hereford or York, but EF and OF and Anglican Use; and also the introduction of the vernacular into that Roman Rite. The Church's Liturgy has indeed not been changeless; but through all its changes the essential identity of English Catholicism has been linked indissolubly with the Roman Rite, the most ancient, the most venerable, the most widely used rite in Christendom, and with the Roman Canon, its only authentic Eucharistic Prayer. So there you go. 1,417 years of continuity in English Catholicism. Until the Era of Archdeacon and his Grand Project. Truly, an alter Cranmerus. Perhaps a friend with his interests at heart should show him that cross in the paving of Broad Street a few feet from the door of the Master's Lodgings of Balliol College, lest a feeling arise that he needs his whiskers singed, and the cry be heard Archidiaconum ad ignes. I had better make it clear that I am far to busy and important a man to chase up euchological formulae for other people, but occasionally a cry for help from the colonies touches a chord in my heart, or whatever the cliche is. So, in circumstances in which I would normally refer an enquirer to The Christian Year: Calendar, Lectionary, and Collects (Church House Publishing, 1997, ISBN 0 7151 3799 9) I will ... just on this one occasion ... assist a Tasmanian. Here is the Collect authorised in Old Mother Damnable for use on the festival of Blessed Priscilla Proudie, Educationalist and Worker for Women's Rights. Almighty and Everlasting God, who raised up Priscilla Proudie from the low estate of the niece of a Scottish Earl, and made her equally adverse to impropriety of every description: grant us so to benefit from the example of her meekness and humility; that we may ever practise perfect abstinence from any cheering employment upon the Sabbath. This collect is a perfect composition. Those learned in such matters will recognise the natural grace of the rhythmic cursus with which it is composed: one trispondaicus, and two velox. None but a liturgical genius could have been so served by his own fine instincts as to produce such a masterpiece. And I will reveal that it comes from the pen of 'Bubbles' Stancliffe himself, quondam Bishop of Salisbury, whose deft and skilful hand guided the Church of England through the minefields of Liturgical Revision. He began life as One of Us; indeed, I remember to this day the moment when an episcopal friend said to me "Have you heard? Stancliffe has ratted". The postman brought Bubbles his mitre the very next morning. He is not yet a member of the Ordinariate. But who can tell what Grace may achieve? What a catch he would be! Professor William Tighe, for very many years a friend of the Anglican Patrimony, as of all things wholesome, reminds us that tomorrow, February 14, is the twenty-first anniversary of the death of Eric Mascall, Priest and Scholar. CAPD. Fr Aidan Nichols wrote that the Catholic Revival in the Church of England, in the twentieth century, inspired "a select band of first rate patristic scholars and systematic theologians. In such figures ... the orthodox Roman Catholic can recognise with but little effort 'separated doctors' of the Catholic Church'". In this select band he names Eric Mascall. Mascall's was indeed one of the most acute minds to detect and analyse the deceptions of the last part of the twentieth century. Now that the tradition represented by Mascall has formally and corporately entered into Full Communion with the See of Peter in the Ordinariates, is it too ... pushy ... to hope that our fellow Catholics will regard these figures as having become their property too? Just as I trust that they will not resent us feeling that their own Saints and great men have now become ours as well ... the Elizabethan Martyrs; Bishop Challoner and his fellow Confessors? Is this what the phrase "Church Unity" means? I didn't actually find it very easy, that February morning, even to get into the Cathedral. As so commonly nowadays, there were people guarding the way in; their expressions that elusive combination of Welcome and We Want Your Money. The usual large notice explained how much it cost, by the minute, to keep the Cathedral open. But I had twenty eight years experience of little boys inviting me to 'sponsor' them. The thing to do is to look apoplectic; the best way I know of doing this is surreptitiously to chafe ones face. This makes it go red. Wide-open eyes complete the effect. I swept in past the obstacles, unpestered and unrobbed. You can guess what I had come to revisit: in the North aisle ... just past the Chantry Chapel of Bishop ffoliott ... there it was. A simple monument designed and executed in good taste. The broken column; the stark words "My beloved wife!" And, round at the side, unobtrusive, the name Westmacott ... it must have been just about the last monument he carved. Pedants among you may calculate that it was a posthumous work. Is the tabernacle of God. And trees for making his rood. But fulsere vere candidi nobis soles ... quod vidimus perisse perditum ducimus ... Fuit Lesbia. I slipped out, unobserved, with no moist eye, after the reading (the last chapter of Proverbs; I had forgotten how truly biblical Mrs Proudie was) and made my way to lunch with a Staggers contemporary, Fr Colin Spikenard - now a brother priest in God's Own Ordinariate - and his wife Jill. There was news we had to share with each other. And I could do with a gin. This is a very occasional series. But you will, DV, get to know some time what I learned over lunch. The Council said that more of Scripture should be put into the Liturgy. The Missal of Paul VI did so. You may not agree with how they did it: but that is a matter of judgement. The Council said that the more hymns should be put into the Office. The Liturgy of the Hours did so. You may not agree with how it did it: but that is a matter of judgement. The Council said that alternative Eucharistic Prayers should be put into the Ordo Missae. The Reformers did so. You may not agree with how they did it: but that is a matter of judgement. Er ... have I just made some sort of foolish mistake? I plan to keep on about the Roman Canon for a while, starting tomorrow. Later today, however, a piece about my recent revisit to a beloved Cathedral City. At an early stage in the reforms which led from the Breviarium Romanum to the Liturgia Horarum, the genius presiding over Hymnology, Dom Anselmo Lentini, proposed to assign a Proper hymn, Omnis expertem, to this feast. Taken from the pre-Conciliar Propers, its ultimate origin was a local Office of our Lady of Lourdes granted to the Diocese of Tarbes (now 'Tarbes et Lourdes') in 1891 by Pope Leo XIII (extended to the Universal Roman Rite by Pope S Pius X in 1907). Its interest is increased by the fact that there are grounds for strongly suspecting that this hymn was composed by the Pontiff himself, Leo XIII, who was (like Pope S Leo the Great) a Latinist of distinction, as well as being an enthusiast promoter of the cultus of our Lady of Lourdes. (I wonder how Pope Francis spends his evenings!) Its text is at the bottom of the page. Other hymns to our Lady which you might like to compare are these***; do you think a stylistic study supports, or otherwise, the attribution of Omnis expertem to Pope Leo? *O lux beata and *Sacra iam splendent for the Feast of the Holy Family: certainly by Leo; Lentini knocked a couple of stanzas off the beginning of Sacra, thus turning it into Dulce fit. These two hymns survive from the Breviary into the Liturgia Horarum. Here is the text of the hymn to our Lady of Lourdes, for those of you who lack a pre-Conciliar Breviary. * Lentini proposed to omit these two stanzas. Huc, hinc seemed to him to imply a Gallocentric world view! You know those heart-rending stories one hears after terrorist atrocities? The gunmen with their submachine guns have slaughtered dozens, but two or three victims have survived by lying down among the corpses and pretending to be dead. Today's Sunday Collect is one of those. As Archbishop Bugnini stood back and with a Clint Eastwood gesture blew the smoke from the end of his gun, he thought he had fifty two corpses in front of him. In fact, two of the fifty two were alive, lying there, motionless, shamming. The fifty two were the Sunday Collects of the ancient Roman Rite. The two that survived were the only two which were left, in the Pauline Missal, occupying the same Sunday that they had occupied in the rite that came down to us from the Patristic period (Epiphany II and Epiphany V). So today is the last Sunday in this Calendar Year upon which those following the Novus Ordo and those adhering to the Vetus Ordo will be saying the same collect. Perhaps it should be celebrated as a remarkable pignus unionis futurae of the time when the Roman Rite will again be a unity, as Benedict XVI hoped. You are sitting there scratching your heads. "Impossible", you cry. "Have you not read Sacrosanctum Concilium? 'There must be no innovations unless the good of the church genuinely and certainly [vera et certa] requires them.' And are you not aware that the Council gave no instruction whatsoever about attacking the Sunday collects?" Indeed. And what makes this act of vandalism worse is that, from the three great Seasons of the Year, not one single Sunday collect survived as a Sunday collect in that season. They were all, apparently, regarded as so truly and certainly [vera et certa] unfit for purpose that they departed, pitiful refugees, taking with them into exile their teaching about the meaning the Roman Rite had historically discerned in Advent, Lent, and Eastertide. I seem to recall that in his famous letter, sent formally from the offices of the Brentwood Liturgical Commission to The Tablet and the diocesan clergy, Fr Butler (as far as I am aware, he is still in post) made much of the fact that when Sacrosanctum Concilium came up for its final vote, only four Fathers voted against it. The poor silly Bu**er does not realise the actual significance of this truth. I am surprised that as many as four voted against it. The four did not include Archbishop Lefebvre, who had no problem voting for it and adopting the first two, light, revisions of the Ordo Missae that followed the Council (1965 and 1967). The Fathers thought that they were voting for a light and consensual updating of the Roman Rite, not for terrorists walking through the streets shooting anything that moved. Pedantic postscript: some sixteen of the old After Pentecost Sunday collects did survive, strangely shuffled up and sometimes mutilated, among the Sunday collects per annum. A couple of the Eastertide Sunday collects survived, unhappily reassigned to Sundays per annum. Some of the Advent, Lent, and Eastertide Sunday collects were allowed to survive as long as they submitted to the indignity of serving just one single weekday each and, in some cases, mutilation. The great Fr Zed has published on his Blog information about a new appeal which has been launched, calling for justice for the Franciscans of the Immaculate. I have decided to publish a piece I drafted quite a time ago, but left unpublished in the hope that the New Year would being us news which rendered it superfluous. Here is my earlier draft. Witch hunts are commonly associated with what happened in Stalinist Russia and in Maoist China and in Germany after the 1944 coup attempt; and, we are told, Senator McCarthy ran a pretty competent witch hunt in the U S of A. I do hope that we are not moving into a period in which the Catholic Church revives the ignoble art of the Witch Hunt. I am moved to say this because of the tone in which the Commissioner of the Franciscans of the Immaculate expresses himself. His correspondence contrives to insinuate a suggestion that his dealings with the Institute became necessary because of 'Cryptolefebvrianism' in the management of the Order by its Founder ... which reminds me of the habits of the Marxist tyrannies and has a certain flavour of George Orwell's 1984 about it. And he refers to the Superior of the SSPX purely by his surname ... another rather nasty totalitarian habit, in which one attempts to strip a disapproved person of all dignity. This is contrary to the practice of the Holy See, which has invariably addressed H E Mgr Fellay with proper respect for his episcopal office. The antidote to witch hunts can, I suspect, be found in the pontificate of S Pius X, the Pontiff who put in place the anti-Modernist oath. Surely, as in every other age of the Church's history, heresy was thus and therein defined, caught in words. Si quis dixerit ... ... Anathema sit. Her dogma, too, was caught in words, in definitions, which expressed the minimum, the broadest formulation compatible with orthodoxy. So ... if you avoided an anathema, if you subscribed a definition, you were in the clear. You were thus protected from the malevolence of the tale-teller and of the Little Bully Up The Road who had it in for you. The precise definition of Orthodoxy and Heresy is a right that every Catholic has; a right that protects him, or ought to protect him, from random abuse of power. By a bewildering, Diabolical, paradox, Vatican II, a Council which desired to threaten nobody and so defined no dogmas, issued no anathemas, has been twisted into a pretext for the issuing of unjusticiable arbitrary condemnations. The heart, I might even say the essence, of Arbitrary Power, of totalitarian tyranny, is the name-calling; the opprobrious epithet which is never properly defined; which, conveniently, is always left vague; vague enough to provide an effort-free charge on which to get somebody. It cannot have been easy, under Mao-tse-tung, to prove that one was not a lackey or a running-dog of reactionary Capitalism. Ergo ... off to the Re-education centre. More recently, it was reported that the Korean dictator Kim Jong-Un, referring to the execution of his uncle, has said that his country is much stronger following the elimination of "factionalist filfth". No wonder the legal proceedings had been so satisfactorily brief. What possible defence can there be against such a crushing indictment? And I do not see that to deploy an innuendo about 'Cryptolefebvrianism' (particularly at a time when one Roman dicastery appears to be manoeuvring the terms 'schism' and 'excommunication' closer to the SSPX) is so much better. What does it mean? If the Church were to define what such a term meant in a formal, precise, anathema, one could prove ones innocence (or be compelled to adjust ones position vis-a-vis the Magisterium). Undefined, it is unrebuttable. Those in the FI who have leadership roles or a munus docendi have already (or else can reasonably be asked to do this) subscribed the oath prescribed in Ad Fidem tuendam and embodied in Canon Law. More than this is a McCarthyite outrage. The safeguard against witch hunts and abusive innuendo is Law and Dogma. This is what the FI, like every other Catholic in the world, have a right to. Make no mistake about it: we would have preferred not to have had this forced upon us, but it has been. It is sad and indecorous to talk about 'War' between Christians, indeed, between fellow Catholics: but it is not by our choice that War is coming. On the EF front, we have seen the Franciscans of the Immaculate deprived of their rights assured to them by the Law of the Universal Church. On the OF front, there is the campaign currently being waged within the pages of the Tablet and elsewhere. Our opponents obviously think they are riding high: with regard to the Franciscans of the Immaculate, the persecutors claim, however improbably, that they have the Holy Father himself on their side. As far as the Tablet is concerned, a director of a diocesan Liturgical Commission felt so confident about the way the wind was blowing that, from his Commission's address, he wrote to the Tablet and to all his diocesan clergy a letter which formally encouraged lawlessness and attacked the status of the New English Translation. As I write this, he is, as far as I am aware, rebuked but still in post. We must stick together. It would be disastrous for those who favour Latin Liturgy, or who favour the Vetus Ordo as strongly as I do myself, to feel that a concerted attack upon the New English Translation of the Missal is just a distant war in a foreign country of which they know and care little. It is not good enough for those who favour the Reform of the Ordinary Form to think "Well, the FI sound an extreme bunch; why can't they just do the OF in the same decent way that I do and be happy with that". Can you really doubt that the Enemy is, in each case, the same? In each case, it is the same desire to ensure that ordinary Catholics are cut off from their birth-right, severed from the historic sources which might otherwise feed their Faith. As a rather Anglican devil - but one very deep in the Lowerarchy - Screwtape - once put it, "It is most important to cut every generation off from all others." We must stick together and stand by each other. Now is not the moment to enjoy the luxury of itsy-bitsy little disagreements among ourselves. Another thing we should stick with and stand by is the New Translation. OK: clergy being clergy, there never could be a liturgical form that every priest felt was totally perfect in every detail. But now is not the moment to talk about some few details which you or I might wish had been done slightly differently. You may have experienced the processes surrounding a proposed scheme of Urban Redevelopment. A neighbourhood is invited to respond to a questionnaire, the first question on which is "Do you think improvements could be made in the area of X?" Well, of course, there could hardly be a human being who couldn't think of something which in his own opinion would improve his own area. So this approach potentially enables a developer to publish the results of the survey as "Consensus! 93% of residents were in favour of improvements". That, in turn, moves smoothly and effortlessly on to the next stage: "Let us consult together about the improvements to be made". And that means they they almost have their hands already on the ££££s and $$$$. My belief is that under no circumstances should we ever say to anybody anything which enables any claim to be made that there is a consensus for change in the current situation (except, of course, to remove the few restrictions Benedict XVI left on the Vetus Ordo). Not to journalists, not to bishops, not to Diocesan Liturgical Commissions, not to brother priests, not to members of congregations, not to your Aunty Mildred or the next Bulgarian gypsy you meet in the street. As that delightful Dr Ian Paisley used to say, "No Surrender! Not an inch!!" The present position with regard to the New Translation is perfect. It is exactly what your parish wants. It is exactly what you want. It is precisely what every other priest you talk to wants. Ahh ... no ... there is just one thing. There should be a process of re-education for clergy who have Problems. Weekly. Starting at 8.30 a.m. on their day off. Clergy ... perhaps one might say simply Male Humans ... above the age of 70 fall into two main groups. There are EUOBs (Extremely Unpleasant Old Blokes; everybody who knows me will be aware that I went into training in my Twenties to join this group). And there are the NOGs, Nice Old Gentlemen. NOGs are the big risk. They read for Holy Orders (sorry; I can't help having a soft spot for these old Anglican expressions) in the Seventies or before, and Kueng and Schillebeeckx still preside over their bookshelves, dusty but unbowed. Dear smiley old things that they are, with the most enchanting wrinkles round their eyes, NOGs have become accustomed to a liturgical patois which skilfully piles anacolouthon on top of parataxis, like Ossa on top of Pelion. And they prefer it. It helps to keep their minds comfortably inert. It means they never have to take a deep breath. It means there is never a risk that one idea might make a fruitful connection with another. It ensures that their congregations will be protected from the dangers of shoots of new growth. NOGs will back up Fr Butler and his cronies, to the ... um ... death, so to speak. I mentioned the other day the old American dissident group "What if we just said Wait [i.e.until Ratzinger is dead]?" This is a good formula and we need to hijack it. "What if we just said Wait [i.e. until Butler and his NOGs are in their retirement homes]?" The future will be safe in the hands of the splendid young priests and seminarians who are coming through the system. That, I suspect, is what the Butlers are most afraid of. They have every reason to be. I have a little more to say about the Fr Butler, Boss of Liturgy in the Diocese of Brentwood, who regaled his brother priests, and the readers of the Tablet, with his views about the current translation of the Roman Missal into English and about its "illegal" imposition by the wicked Vatican and the pretty wicked English hierarchy. We all, I hope, realise that there is something thoroughly nasty going on here. Do you remember how, a few years ago, there was a group of clergy in American, opposed to the new translation, who started a movement called "What if we just said wait?" In the 'Vernacular', upon which Butler regards himself as such an expert, this was clearly to be translated as "What if we just said wait until Ratzinger is dead?" And Ratzinger, in the view of these unpleasant individuals, is now dead. So this is their moment to try to bend the ear of a new regime in Rome and to try to reverse the losses which they have suffered in the last decade. It may be something of an up-hill struggle for them; the English-speaking hierarchies, having had 'Liturgy' on their agendas for decades, may not be uniformly keen to go back to square one ... the blue books, the green books, the latest schedule of proposed changes ... and all the rest. And Parish Treasurers are not likely to be in the forefront of a movement for binning all those expensive and still-shiny Altar Missals and Mass Cards and buying new ones. (It is rather sinister that those recently calling for change included a ... liturgical publisher! Turkeys may not vote for Christmas, but turkey-sellers very certainly do.) But ... if they could get a roll going ... if they can persuade disaffected 1970s-trained clergy to open their aged mouths ... if they could somehow manipulate the media so as to present a view that their aims are "what there is a widespread call for" ... and that this is all bound up with burying Ratzinger and moving on to the broad sun-lit uplands of the Francis pontificate ... nuff said, my dear brethren; you see the dangers. Perhaps this is why Butler so boldly put his head above the parapet: he detected the strategic moment. Clearly the Tablet will not be, is not, in the rear-guard of this movement. It is worth reminding ourselves why this battle is so very important. For four decades after the Council, Catholics were made to worship by a rite which had been changed and in which some important elements of Catholic truth (sin, grace ...) had been weakened. That, however, is by no means the worst news. In that post-Conciliar Latin Missal, a lot of material did still survive from the older rite, and very many of its 'new' materials were drawn from the ancient Roman (and some other) Sacramentaries. The real, major, disaster is that in the 1970s an English translation was imposed which obscured the lines, theology, ethos, of the Paul VI Missal in much the same way as a fair bit of our Oxfordshire countryside is now obscured by flood-water ... you really can't see much more than a few trees marking where some of the field-boundaries are. Think of the new 2011 translation as a Major Drainage Project; it has as its purpose to reveal the landscape once more; to open up for English worshippers the fields and roads and paths, the culture, the world-view, the imagery, the biblical theology of the Missal which emerged in the aftermath of the Council, and which was in greater continuity with the older rite than some people (on both sides) realise. The Father of Lies, of course, is an adept at putting things exactly the wrong way round. He and his followers claim that the older 1970s English translation somehow is 'the Council'. But that translation deliberately buried, concealed, the Council's teaching beneath bland, cliche-ridden mistranslations ... dirty flood-water. Perhaps you will forgive me for reminding you of the oft-quoted maxim of Hitler (or was it Goebbels?) that, if you make a lie big enough, people will believe it. You wouldn't credit it, would you, if you hadn't seen it happen: an entire generation was persuaded by deceitful men that the translation which prevented them from being fed with the post-Conciliar liturgy ... was what the Council wanted! Next time, I hope to conclude by arguing that this is the time to close ranks, whether one is a 'tridentinist' or a 'Reform of the Reform' enthusiast, in order to combat the Enemy of all that is good and holy and wholesome. Because he's up and active again. Splendid! Our Holy Father has made clear that First Communion should come after Confirmation. And Cardinal Nichols will celebrate a Mass of Thanksgiving in Birmingham Cathedral, upon becoming "Cardinal for England and Wales". I've never understood the position of the Archbishop of Westminster. In the front of my Breviary, there is the usual licentia imprimendi by Cardinal Griffin: and his coat of arms includes a Primatial Cross, but the text does not describe him as [Totius] Angliae Primas ... simply as Coetus episcopalis totius Angliae et Cambriae Praeses Perpetuus. But Cardinal Heenan signed Lumen gentium as Primas Angliae, even though he was not Archbishop of York. Subsequently, the Primatial Cross was removed from the arms of the See of Westminster. One wonders what led to this and whether the excision was by the Holy See. One wonders why it was put there in the first place, making the arms look in monochrome just like those of Canterbury, when the Holy See granted the arms. Does Vincent Nichols have any primacy over the four other Metropolitan Archbishoprics in England and Wales? Will a Primatial Cross be carried in front of him? I thought the term and concept of 'Primate'was obsolete except in European countries where it has survived as an archaic and titular anomaly. Has it been de facto replaced by 'Cardinal'?